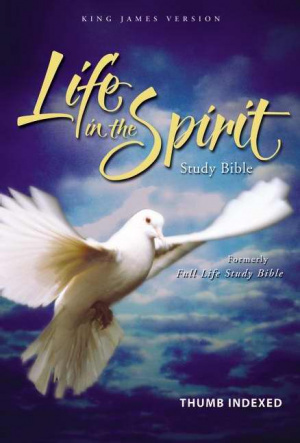 Discover the Biblical Foundations of Life in the Spirit The Life in the Spirit Study Bible will help guide you into a Christ-centered, righteous and Spirit-led lifestyle. Previously titled the Full Life Study Bible, this new edition includes updated and expanded notes, a new word study feature, and a new interior to meet the needs of Spirit-filled Christians today. In a culture that requires believers to depend strongly on God and his Word, this Bible will help you cultivate a deeper relationship with Jesus Christ and the person of the Holy Spirit as the source of the Church's power. Features include: Themefinders--12 icons located by Scripture passages tell at a glance which theme a given passage addresses. Themes include: Baptized in/Filled with the Holy Spirit, Gifts of the Holy Spirit, Fruit of the Holy Spirit, Healing, Salvation, Witnessing and more. Study Notes--Updated and expanded, extensive notes offer insights that help you understand and apply the Scriptures. Articles--77 articles address a wide variety of topics surrounding life in the Spirit. ;Word Studies--This brand-new feature sheds light on the meanings of key words in their original Greek and Hebrew contexts. Charts--5 custom-designed mega-charts visually portray "Old Testament Prophecies Fulfilled in Christ," "The Kingdom of God Versus the Kingdom of Satan," "The Gifts of the Holy Spirit," "The Work of the Holy Spirit," and "The Last Days of History." Plus--Book introductions/In-text maps and charts/Full-color map section/Concordance/Words of Christ in red/Subject and Themefinder indexes/Reading plan/Tables of contents for articles, maps and charts. Wonderful as it is to be saved for all eternity, we also long to walk with the Lord today. We want to hear his voice, know his heart, receive his gifts, and participate in what he is doing. We desire what the early church had that Jesus promised would be ours as well: lives lived in the intimacy, vision and power of his Spirit. Based on the common underpinnings of Pentecostal and charismatic traditions, the Life in the Spirit Study Bible is designed as an important Biblical resource for all Christians, regardless of church background, who long to deepen their connection with the Holy Spirit. ;If you are hungry for greater intimacy with Jesus ...if what you've read in the Bible suggests amazing possibilities for your personal relationship with God ...if you long to experience the message, faith, devotion and power described in the book of Acts ...then this study Bible will help you build a bedrock of spiritual understanding and faith for living a down-to-earth life equipped with the presence of Christ and the power of the Holy Spirit. Millions of Christians around the world continue to discover what it means to walk in the Holy Spirit's power and presence. If that is your desire, the Life in the Spirit Study Bible will prove a valuable companion in your spiritual quest. First published as the Full Life Study Bible, the Life in the Spirit Study Bible has enjoyed a stunning international appeal. Working together, Zondervan and Life Publishers continue to spread the message of this Bible worldwide. The classic King James Version (KJV) was first published in England in 1611. Commissioned by King James I, it was the achievement of nearly fifty translators, who over four years revised the Bishop's Bible in the light of available Greek and Hebrew documents as well as other contemporary European translations. The result was the first Authorized Version, known to Americans as the King James Version. Subsequent editions, providing important corrections and standardizations, include the Cambridge edition of 1762, the Oxford edition of 1769 and Dr. F.H.A. Scrivener's Cambridge Paragraph Bible of 1873. Zondervan uses the Scrivener edition. KJV Life in the Spirit Study Bible: Burgundy, Bonded Leather, Thumb Indexed by Zondervan was published by Zondervan in March 2003 and is our 34010th best seller. The ISBN for KJV Life in the Spirit Study Bible: Burgundy, Bonded Leather, Thumb Indexed is 9780310928249. Be the first to review KJV Life in the Spirit Study Bible: Burgundy, Bonded Leather, Thumb Indexed! Got a question? No problem! Just click here to ask us about KJV Life in the Spirit Study Bible: Burgundy, Bonded Leather, Thumb Indexed.